The subject of our product review in this article is a product called Durham’s Bee Farm Canker-Rid. 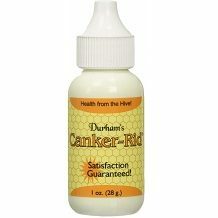 The manufacturer of Durham Bee Farm Canker-Rid claims that it can help to provide immediate pain relief for canker sores, mouth sores, and even mouth ulcers. 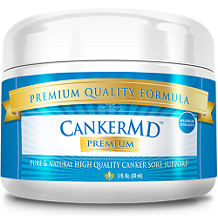 Read on to see if Canker-Rid can help relieve the discomfort associated with oral sores. There was no information on the company website regarding the ingredients in Canker-Rid. We found some information from a reviewer who commented that according to the packaging, food alcohol and propolis is mixed together with nectar, wax, pollen and bee bread to form this medicine, but this was not confirmed without the bottle in front of us. Two key ingredients that appear lacking here are; benzocaine which can help to relieve the pain of the canker sores, and Salicylic acid for optimal canker sore treatment. Dry the affected area before applying drops. Apply a small amount of the product to the mouth sore using with a cotton swab. Apply up to 4 times a day. Consult with your dentist, pharmacist, or doctor before using. Avoid swallowing the product. Each bottle contains 1 ounce of medicine, and the manufacturer claims that one bottle should last up to 6 months. One bottle costs $19.95, with discounts available when buying in larger amounts. If you buy 3-5 bottles, the cost per bottle drops by $1, purchasing 6-11 bottles receives a $2 per bottle discount, and purchasing more than 12 bottles gets you a $4 discount per bottle. For the purchase of only one bottle, shipping is an additional $3.41, with the option for shipping upgrades. Orders of more than $75 receive free shipping. The manufacturer offers a 100% money-back guarantee, but there are many rules. Their guarantee only lasts for 30 days post purchase, so you must decide whether you want to request a refund quite quickly. A 30 day money back guarantee is not typically long enough to know how a product will affect you. Also, shipping costs, both original and return, are non refundable and will be the responsibility of the customer. In order to be eligible for the money-back guarantee, you are not able to take advantage of the bulk-shipping discounts, as any bottle of this product after the first will not be eligible to have a refund. There are a few things that we liked about Durham’s Bee Farm Canker-Rid. The company claims that each bottle should last up to 6 months which makes the per bottle price very reasonable. Not clear how reliable but there are a number of positive reviews for this product listed on the manufacturer’s website, (company websites rarely show the bad reviews!). We do have some concerns about this product however. We were unable to find a reliable ingredient list for this supplement. Many reviewers complained about the shape and delivery of the bottle saying that it is messy to apply and that they were unable to properly apply the medicine. Finally, while the manufacturer does offer a money-back guarantee, it has so many rules, it may be very difficult to actually receive a refund should you try to request one. For these reasons, we are unable to recommend Durham’s Bee Farm Canker-Rid for the treatment of canker sores.